While no clear information regarding the formation of the organization is available, it is assumed that BLF was formed in 1960s in Damascus with the support of Arab Nationalists leaders. 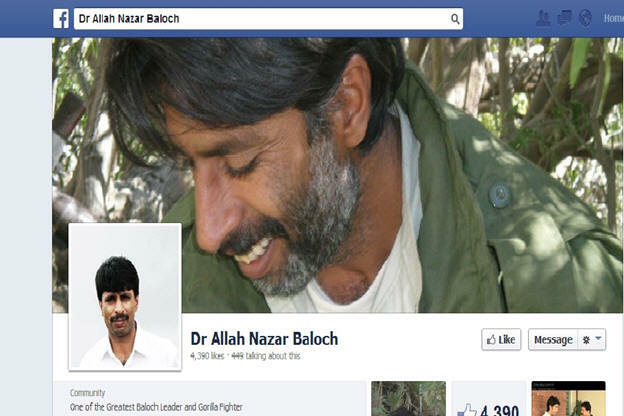 Son of Nabi Baksh Baloch, Allah Nazar Baloch was born in 1968 in a remote area of Baluchistan called Awaran. After graduating from high school in 1986, he moved to Kech Turbat where he did his Fsc in premedical. He was a bright student and for the same reason, he ended up in a medical college in 1992. During his MBBS, he realized the backwardness of Baluchistan. He blamed it on the Pakistani government and therefore started hating Pakistan. In an effort to liberate the province from the suppression, Allah Nazar had joined Baluch Students Organization (BSO), however at that time the student organization was divided into three fractions and was not very effective. For this reason, he founded BSO (Azad) in 2002. In a short time, he and his party gained fame in the province. However, his organization turned violent with time and also joined hands with other extremist organizations operating in Baluchistan. Allah Nazar was arrested by the authorities’ in2005 but was later released after his students went on a hunger strike. He was again picked up by the intelligence on the suspicion of inciting violence in the province and after a year of interrogation, was set free. After getting released, he established BLF. Spokesman: Basham Baluch / Gohram Baluch . No significant information regarding both these spokesmen is available. While Marxist theory revolves around the liberation of oppressed nations and individuals, BLF believes in liberation of Baluchistan province. It is a Baluch nationalist militant organization, which is headed by Dr. Allah Nazar Baluch. It is based and operates in the province of Baluchistan. Whereabouts of the offices as well as the structure of the organization is not known. Proscribed on September 08, 2010. Significant information regarding the recruitment tools is unavailable, however the outfit usually recruits members from Local tribes, Baluch Students Organizations, schools and colleges. BLF, a separatist Baloch guerilla outfit carries out militant activities and advocates violent means in order to gain independence from the Pakistani state. 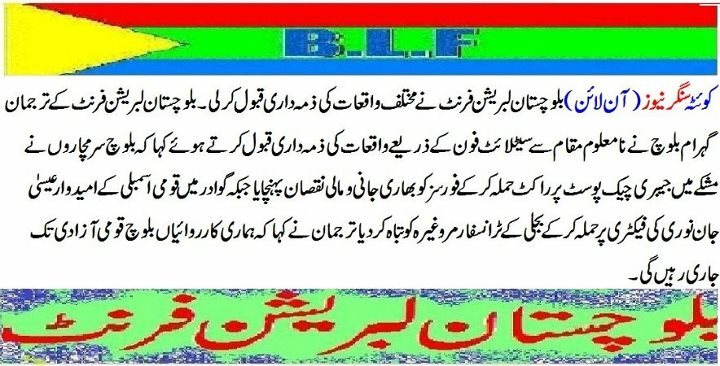 Areas of Operation BLF operates in Baluchistan Province of Pakistan. Linkages The group has linkages with Baluch Students Organization (BSO) as their chief had been affiliated to it in the past. BLF also has links with other militant organizations such as Baluchistan Liberation Army (BLA), Baluch Republican Army (BRA) etc. BSO had also assisted in reviving the organization during the 1970s. Pamphlets and press statements by the spokesmen and the leader. BLF is not highly active on social media, however it has few pages on Facebook through which it connects with some of its followers. Name Variations It has also been referred to as Baloch Liberation Front in news stories. For instance, the incidents of attack on coastguard check post in Gwadar in July 2013. As per the available information, there is no reliable data on its formation and evolution. The group was formed in the early 1960s during the 1962 Baluch insurgency. BLF originally professed to be a Marxist-Leninist liberation outfit, while they were also alleged to be funded by the former Soviet Union. 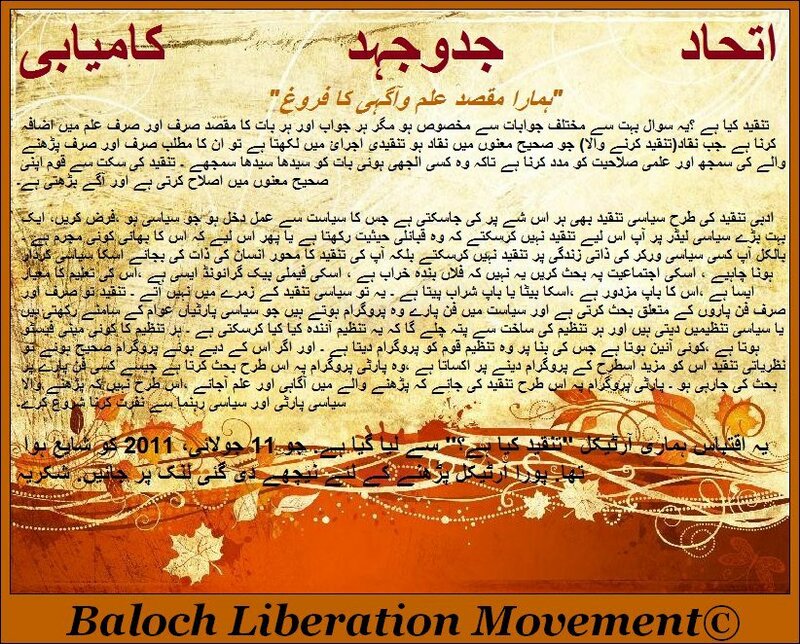 During the 1970s and in 2005 Baluch Students Organization (BSO) had an important role in reviving the outfit. Most of the available information is in relation to its activities and the profile of its commander Dr. Allah Nazar Baluch and Baluch Student Organization. During the current unrest in Baluchistan, the group has sprung into the limelight after 2005, where it started engaging the security forces in Baluchistan. The outfit has targeted migrant workers and is also alleged to be involved in threatening journalists and media personnel. The outfit propagates violent means for liberation of Baluchistan and denounces any inclusion within the democratic framework within the Pakistani state. The organization focuses its efforts on recruiting Baluch youth into their cause. They also have presence in colleges and universities in the form of student organizations. There are no examples of pamphlets available, which are being distributed by the outfit to propagate their cause; but the use of material has been mentioned by the members of the organization. 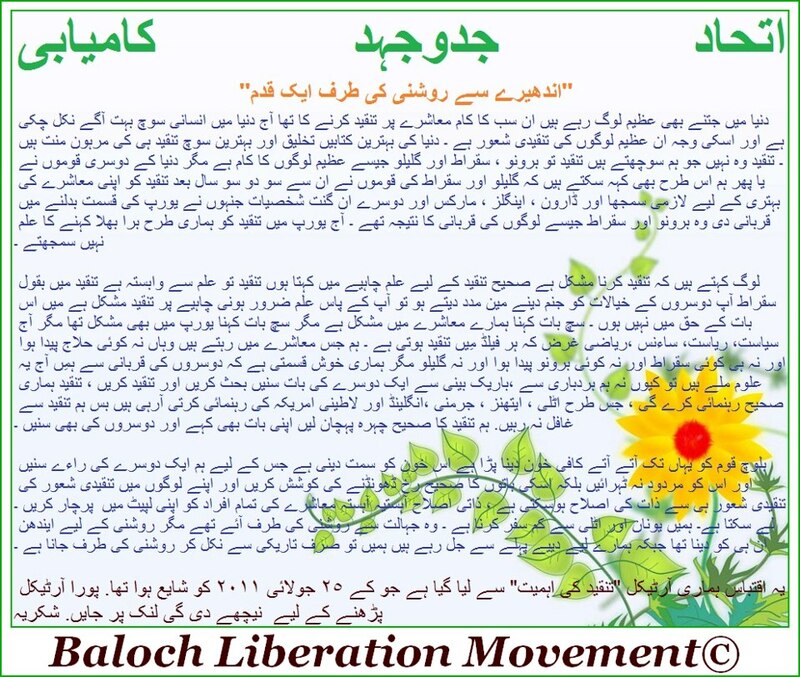 The materials encourage the people of Baluchistan, especially the youth to join the armed struggle. They give statements to the media in order to promote their viewpoint and also to highlight the various activities carried out by them. These include call for boycotts, protests and hostile engagements with the security forces. These statements mostly appear in newspapers and websites aligned to their ideology and are replicated on their Facebook page. As mentioned earlier the organization utilizes the social media to promote its activities and glorify the militancy carried out in the province. The press releases by the outfit are replicated over the social media, while their statements are also posted.